When Rogier van der Weyden painted his Saint Columba Altarpiece(ca. 1455), the Feast of the Incarnation had been celebrated by Christians for a millennium. The large central panel of the altarpiece represents the Visitation of the Three Kings, the magi of Matthew, and the right panel the Presentation of the Infant Jesus in the Temple. The left panel of the triptych contains our beautiful Annunciation image. The Annunciation was regarded in the high Middle Ages as a subject particularly well suited to adorn the reredos of an altar, because of the mystery connecting the eternal Word of God and the Word made flesh in Christ. The painter’s focus here is on the moment of their conjoining. Mary, a prayerful reader of the Scriptures, kneels before a folio book too large to be a medieval Book of Hours. As she is reading she is surprised by the angel Gabriel, who proclaims his greeting, ‘Ave Maria, gratia plena, domine tecum’ (‘Hail Mary, full of grace, the Lord is with you,’ Luke 1:28). These words are depicted as logoi spermatikoi (seminal words), words whose utterance performs what is already announced on the open page of Scripture before the Virgin (usually when visible Isaiah 7:14, ‘A virgin will conceive and bear a son’). The golden greeting is paralleled by the downward flight of the dove of the Holy Spirit ‘as a sunbeam through glass,’ like the traditional lily a symbol for her unblemished virginity. Ominously Gabriel’s visible declaration visually forms with his scepter a sign of the Cross to come. Yet as Mary turns toward his greeting her hand is already raised over the text in the iconographic gesture which signifies her words in Luke, ‘Be it unto me according to thy Word’ (Luke 1:38). We note that the Virgin’s bedroom is strangely evocative of a church. Her bed is dressed in red, the color of charity, and has one corner of its canopy drawn up in a pear-shaped evocation of her womb. She is simultaneously an exemplar of the faithful student of the Divine Word, hence the faithful Daughter of Zion, and prototype for the Bride of Christ. In all senses she has been faithfully waiting on the Word. 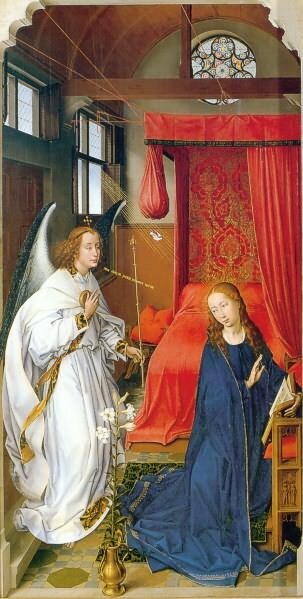 Van der Weyden here makes the hidden mystery of the Incarnation accessible to our eyes and hearts just at the moment the angel speaks, while the attentive Virgin reader, already ‘hearing’ God’s Word, offers her consent. For a thoughtful viewer reflection on this painting is at one level to imagine the miraculous moment nine months before the birth of the Savior; at another it is to permit the mystery of God’s eternal presence to enter our own consciousness now, as it did Mary’s, and to ponder the magnitude of the Divine Wisdom to which, as in the center panel, the wisdom of the world will at last pay homage. Rogier van der Weyden: St. Columba Altarpiece, ca. 1455, 138 x 153 cm, oil on oak panel, Alte Pinakothek, Munich. Rogier van der Weyden or Roger de la Pasture (1399/1400 -1464) was an early Flemish painter. His surviving works consist mainly of religious triptychs, altarpieces and commissioned portraits. He was highly successful and internationally famous in his lifetime. From 1436 onwards he held the title of ‘painter to the town of Brussels’, a very prestigious post because Brussels was at that time the most important residence of the Dukes of Burgundy. He worked from life models, yet he often idealized certain elements of his models’ facial features; they are typically statuesque, especially in his triptychs. Van der Weyden used an unusually broad range of colours and varied tones in his finest works; the same tone is not repeated in any other area of the canvas, even the whites are varied. The quote is from Hans Urs von Balthasar: The Glory of the Lord: a Theological Aesthetics, vol.1, 234, Ignatius Press – San Francisco, 2003. David Lyle Jeffrey has been Distinguished Professor of the Humanities and Literature at Baylor University since 2000. A voluminous author, he is the editor of A Dictionary of Biblical Tradition in English Literature (1992) and author of People of the Book (1996), Houses of the Interpreter (2003), Christianity and Literature (2011).